Decorating your home can be super fun… and super overwhelming. When faced with a gigantic blank slate, it can be difficult to know exactly where to begin. With paint? With the perfect sofa? What about that piece of art you love? While you’re trying to decide on all these different things, we can definitely offer some tips on how to choose furniture color. 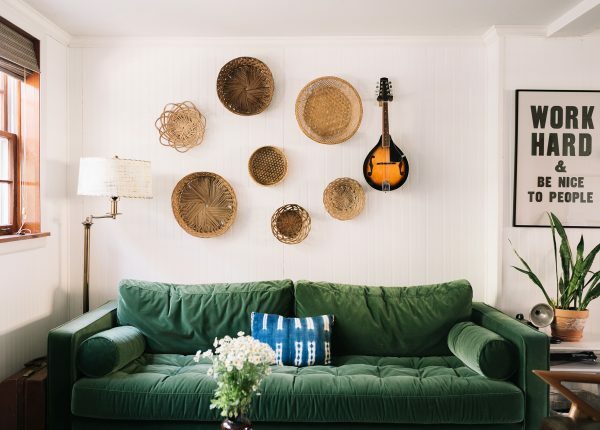 We love the way that Amber Ulmer has incorporated natural tones with pops of vibrant green. Psst – Amber, your Grass Green Sven looks gorgeous. Unlike our post about picking the perfect sofa color, these tips are more related to a head-to-toe re-up of your space. Maybe you’ve recently moved, saved up to redo a certain room, or just finished a renovation. You’ve got a shiny new (to you) room in front of you, and the possibilities are endless. Like staring into a void. A void of possibility! First off, it’s important to consider how color influences feeling. While there are some scientific correlations (such as yellow making you feel positive and hopeful, or blue making you feel calm and at peace), there are also personal ones. Maybe you loved the turquoise toilet of your childhood. Or your first boyfriend’s apartment was painted lilac, but curiously smelled like Cheeto dust, so lilac as a genre is ruined for you. Whatever your personal associations with color, they’ll influence the shades you want in your home. Personal comfort should always trump trend: when making a shortlist of your favorite pieces, be sure to check in with yourself as to whether you’re picking a particular chair for the ‘gram, or because you know it’s going to be a great long term investment. If you’re really struggling to identify your home-style, take some cues from your closet. What colors do you gravitate towards on a daily basis? Are you an adventurous dresser? Take these cues to heart as you consider how to choose your furniture color. 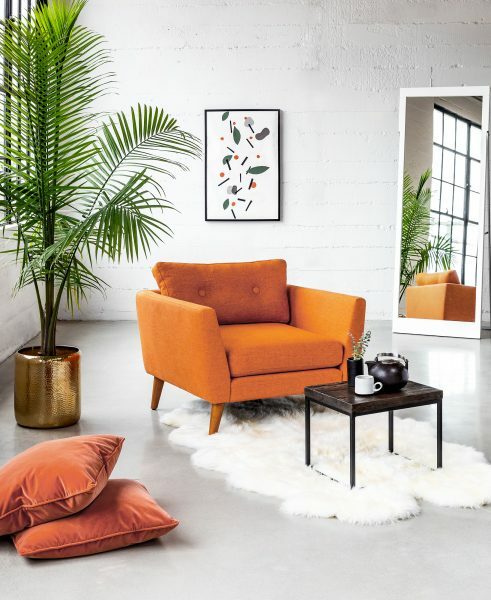 We shot the Emil chair in our studio, pairing the pretty Papaya orange with fresh whites and some homemade art prints. What Comes First, the Paint or the Furniture? When you’re trying to figure out how to choose furniture for your home, you might be tempted to paint the whole dang thing and then decide. Paint seems like a good foundation, right? If you’re planning on painting your house white, then go for it. But if you’re more adventurous with color, are considering a feature wall, or just aren’t sure… maybe hold off the rollers. Choosing your furniture first helps you hone in on a palette more naturally. If you find yourself gravitating to really strong, bright colors for your chairs and sofas, a neutral wall color is easy to style against. 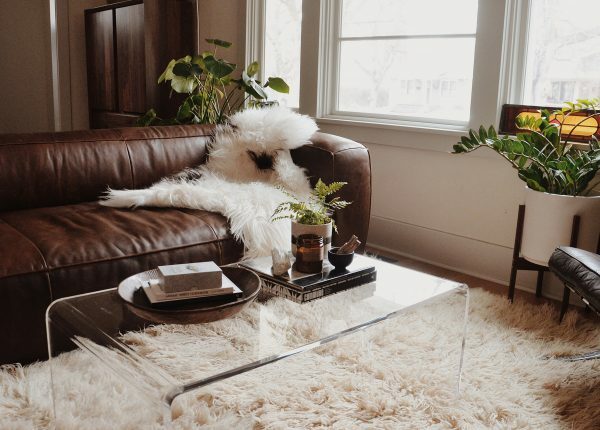 But what if you fall in love with a sofa — like, head over heels, can’t eat, can’t sleep in love with this sofa — and it only comes in neutral colors? The sofa and you belong together, so it’s coming home. But you might want to change up your wall color to accommodate this unexpected change in plan. Remember: paint options are infinite, but furniture comes in a specific selection of shapes and colors. AphroChic paired cool grey Triplo sofa with stately purple drapes for a room that is equal parts regal and minimal. It’s also important to remember that injecting color is as easy as a new throw pillow. Yes, some furniture pieces are a considerable investment, but a sleek new coffee table is more affordable and less work than a whole new paint job. Accessories are the key to easy seasonal swaps. Neutral colors, blues, linen-y fabrics. Want to incorporate grandma’s paintings, masks from travels to Africa, etc. Need a beautiful shelving unit for this. Family room will have a lot of gathering, but also be a place for reading and playing games, so want pieces that double as functional storage. Furniture doesn’t have to be arranged around a single focal point. 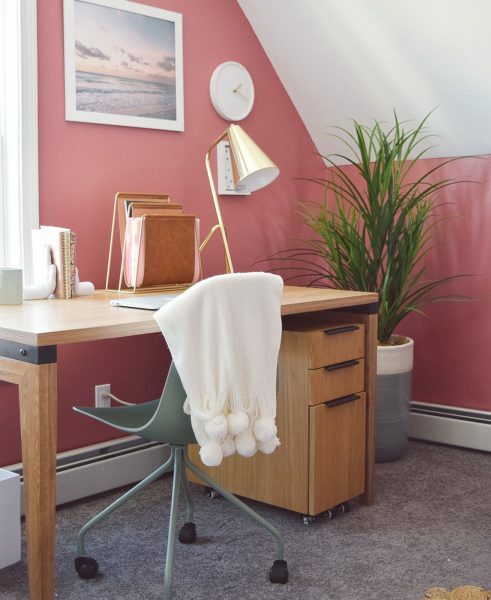 When OneBrassFox re-did her office space, the Svelti office chair and Madera desk worked beautifully alongside her rose walls. Even though this space was created around personal preferences, the expanded list already feels very clear and offers direction regarding layout, style, and how to choose your furniture color. The Sitka sofa in Mist Gray, for example, is cushy, a beautiful neutral color, and low profile. The Gaba Sofa in Petrel Gray is modular, so you can accommodate a stretched out, lounge-y nap, or a party of 15. Incorporating pieces with history means you have accent pieces ready to go, and ready to inform the secondary colors of your space. Did grandma’s paintings use a lot of green? Hone in on that color and find other ways to echo it in the room — like the Embrace lounge chair in Moss Green. Having no TV means the central focus of the room is more likely to be a coffee table, so you’ll want to focus on finding one large enough to accommodate its function. 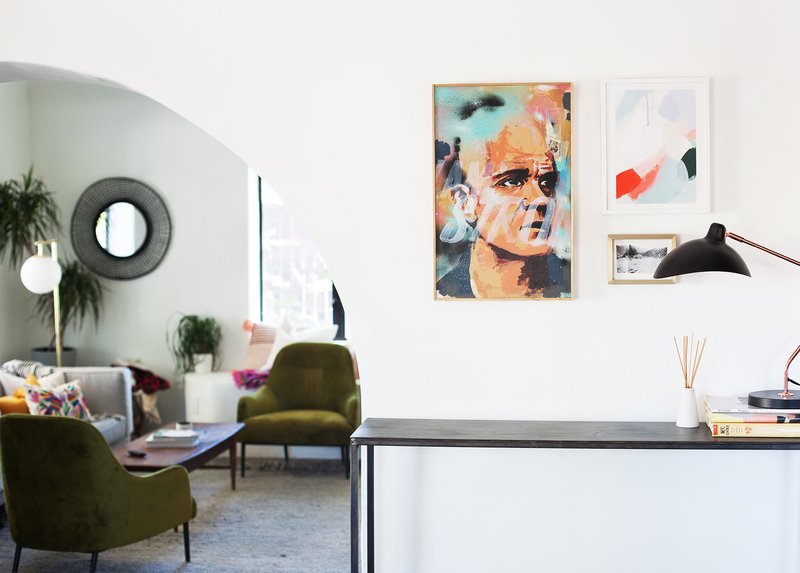 Try making your own list of what you want out of a room, and see how it naturally expands, and what it can tell you about the style you’re after. The amount of light your room gets will determine how bright or muted your chosen pieces appear. Before you start firing off any major decisions, take a look at the way natural light works in your room. If your room is naturally bright all day, you have the opportunity to play with more bright, hot colors. The sun compliments their intensity and turns up their vibrancy. Alternatively, if your room only gets sun in the morning or late afternoon, you might want to embrace that and choose a darker, moodier hue. If you have time, a swatch test can be a great way to see which colors work best. Try painting a two to three foot area of your space in your chosen color, and then note how the light works in the space for a week or so. You might just save yourself the trouble of repainting the whole room. 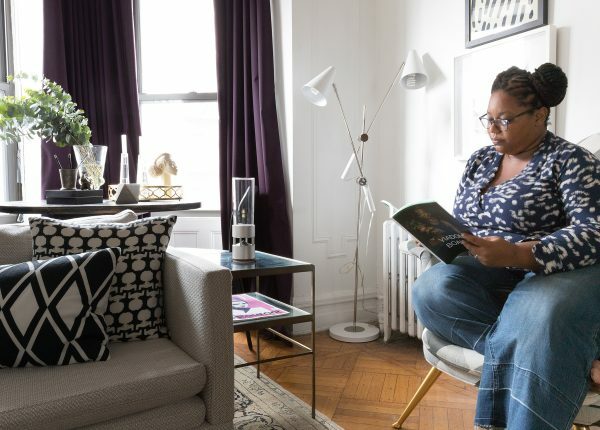 We love how Bridget Ambrose‘s dark and moody space is lightened up with playful accessories and that cool lucite coffee table. The Cigar sofa looks great with her light walls and plant life. When figuring out how to choose your furniture color, rely on your personal style.Take cues from your clothes, treat your Pinterest board as a guide (not a prescription! ), and consider the impact that light will have on your space. It’s also about having a little fun. That part will come once you’ve narrowed down a couple of your initial picks — promise. How to protect outdoor furniture.